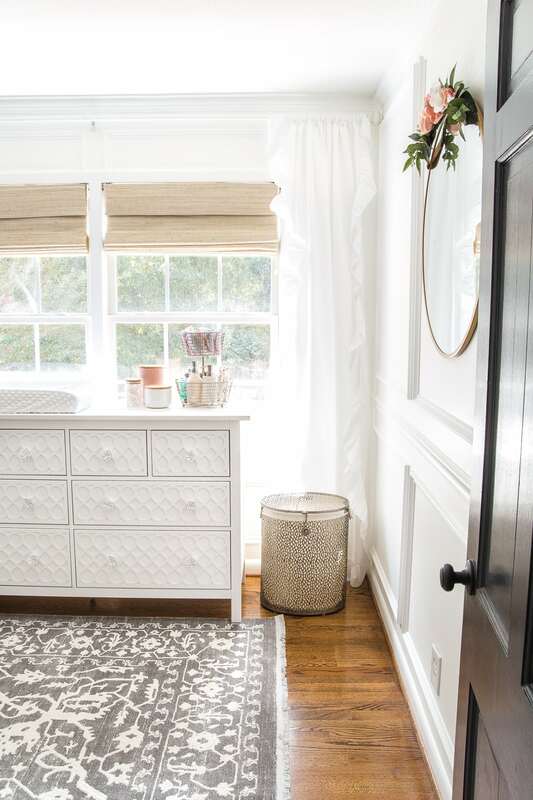 An all white nursery makeover room reveal with classic, vintage style furniture, Anthropologie-inspired patterns and textures, and floral accents. Cue the girlish squeals, y’all! Because the nursery makeover is FINISHED! Oh, my nesting little heart can barely handle how sweet it is. Ever since we found out this baby bean would be arriving and that we were expecting another little princess, I started on a nursery decorating spiral. The one little catch I had for this nursery though was that I didn’t want it all to be in-your-face-pink. I remembered the chaos and stress and sleeplessness all too well from when Olivia was a baby (back in the days when we lived above my parents’ garage). And so, this time, I really wanted to create a space that was peaceful and soothing for us and Baby Regan. I hardly recognize this room! Robert did manage to do all of the picture frame molding himself though, which is definitely one of my favorite projects ever. I’m pretty amazed how much we actually stuck to my original vision for this space because there always seems to be some thrifted find that changes my direction most of the time. 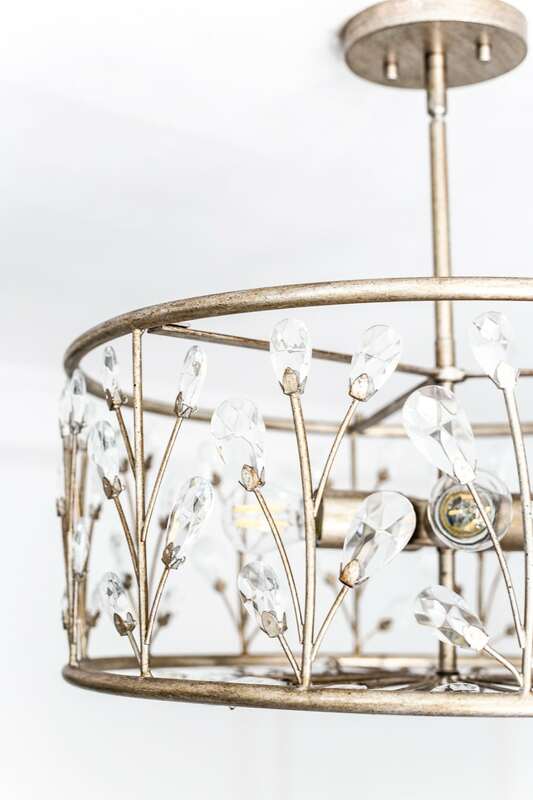 One of the elements I had my heart set on from Day 1 was ripping down the old ceiling fan to replace it with this gorgeous pendant light we got from Del Mar Fans & Lighting. 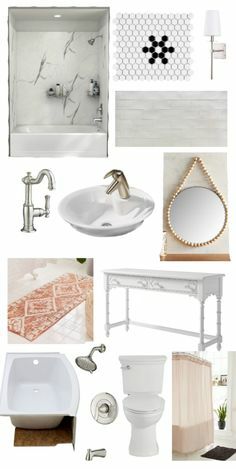 I love that it’s feminine and glam with a modern/vintage vibe. The light bounces around beautifully in here. 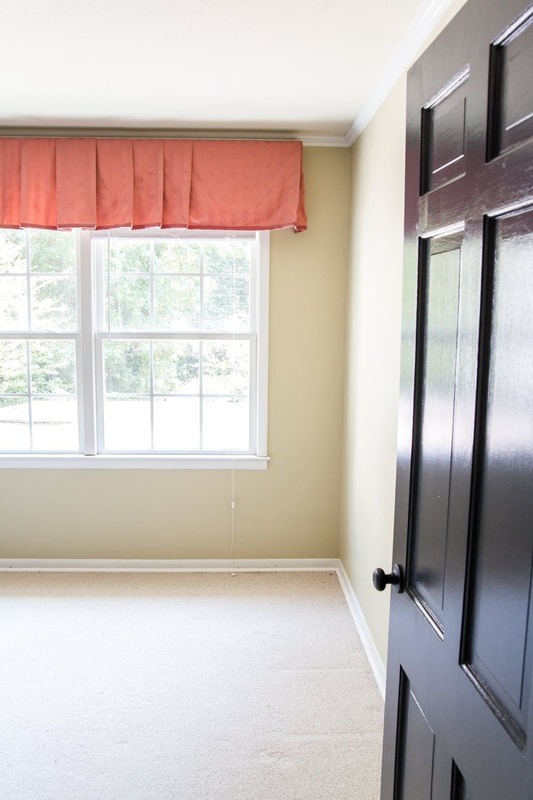 The sliding closet doors were a sad situation before and were constantly falling off of the track. So Robert and I replaced them, and I painted the doors in the space using my usual method in the color Benjamin Moore Stonington Gray. It’s still calming and neutral but creates some contrast against the walls painted in Magnolia Home True White. 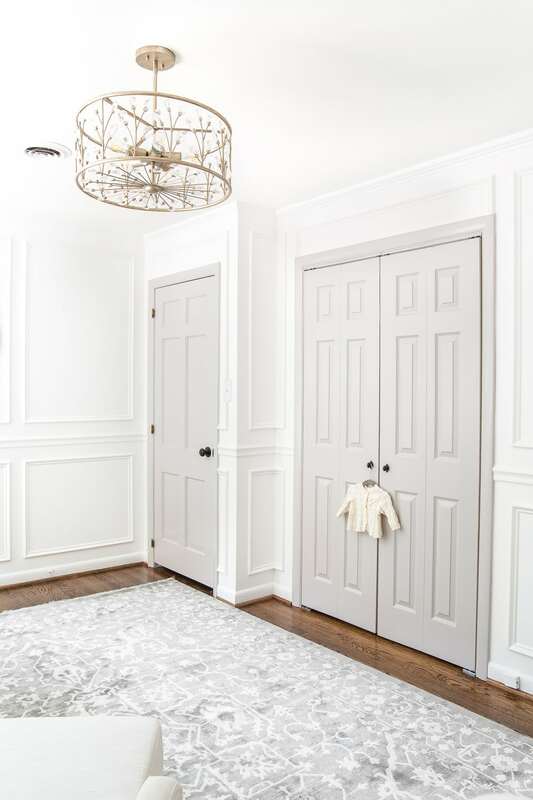 To add softness to the hardwood floors (and help with noise reduction because an echoing crying newborn at 2 am is not a fun situation), we brought in this gray and white rug from eSaleRugs. 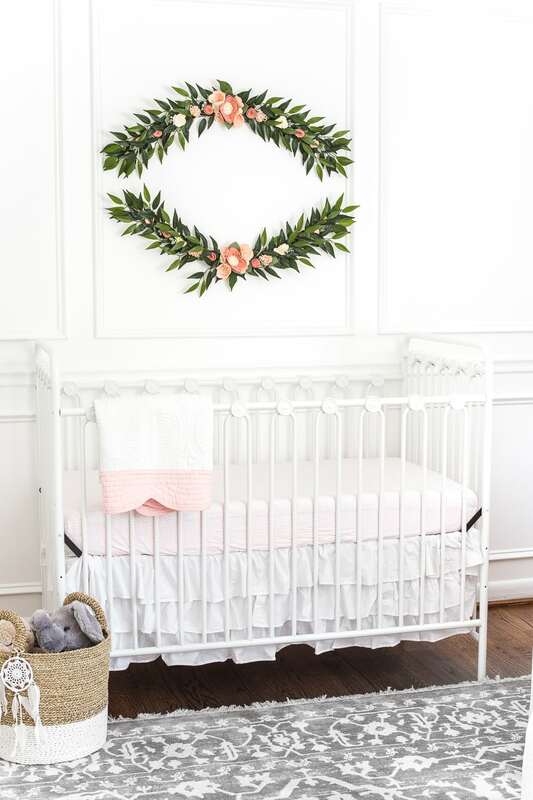 I actually originally planned to use a cheaper white metal vintage-style crib, but when I went to order it, it was out of stock and wouldn’t arrive until way after Regan was born, so I went with this convertible white metal crib option instead. In the end, I think it’ll be a happy accident because we’ll be able to stretch its use into her toddler years. For the bedding, since I don’t really see the point in using pillows and bumpers for safety reasons, I just picked up this pale pink print crib sheet and ruffled crib skirt. To add a little color and texture to the walls, I found this felt flower swag garland set that is one of my FAVORITE things in the room. To add some soft lighting in here for nighttime, I opted for this floor lamp (it’s sold out now but this one is similar). 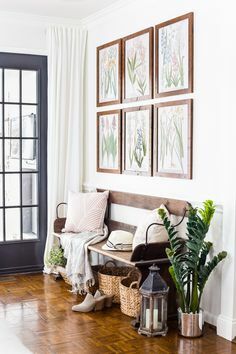 For a touch of color on the walls, I hung up these prints from Society6 with desert flowers and succulents from an artist called Nature Magick. Aren’t they sweet?! Oh. my. gosh. By the way, confession time: Do you see anything wrong with our bi-fold closet door knobs? I had a total blonde / preggo brain moment screwing those in. Another tip: Knobs on bi-fold doors don’t open like that. 😉 Doy! We’ve known this time around with baby #2 (learned the hard way) that springing for a good glider is the way to go. We still managed to find this glider that was a decent price in comparison to the pricier designer brands that were $1,000+. And it is so, so comfy. I rounded up a few other gliders that are pretty but not too pricey in this post. 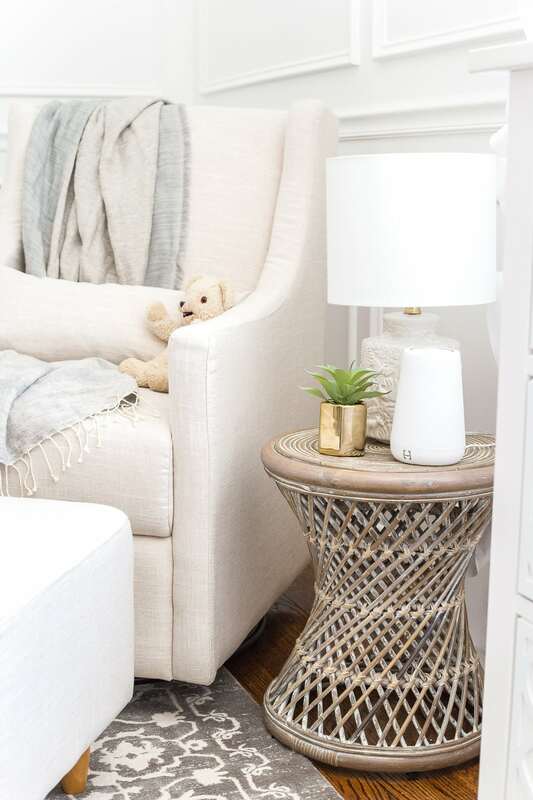 For a handy little table to keep items in easy reach while I’m nursing, I used this garden stool with this accent lamp on top for some soft light during nighttime feedings. 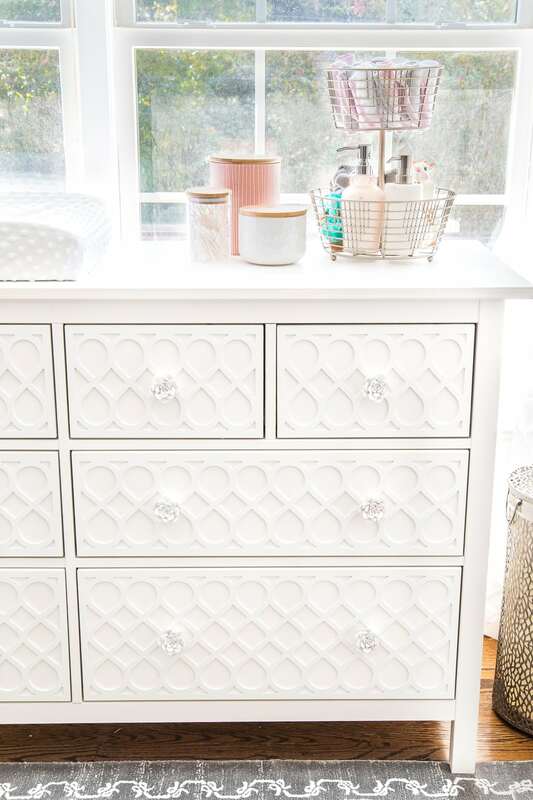 For the first time in a very long time, I actually didn’t buy a dresser at a thrift store and opted for this IKEA Hemnes one instead that I jazzed up using these appliques from MyOverlays. I didn’t want any funky thrifted dresser smells getting on baby clothes (which sometimes can be an issue), and the great thing about IKEA is there are so many great organization systems for the drawers. I’ll be sharing more about that part soon though. 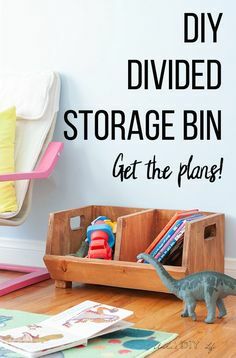 Important side note: ANCHOR those dressers, y’all! Keep those precious babies safe. 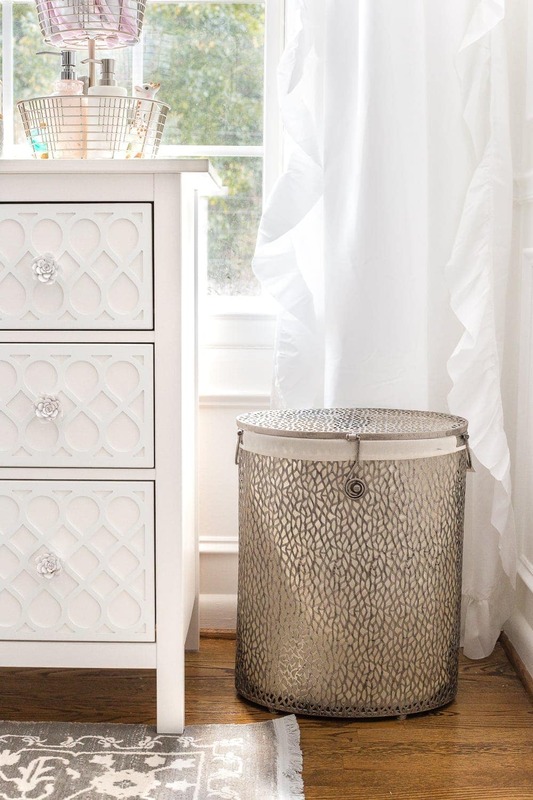 I found this lidded hamper from HomeGoods to stick beside the dresser and help with the messy changing situation. I just realized the print in the metal matches the print on the crib sheet. Ha! Totally not planned. Maybe a subconscious thing. Apparently, my brain coordinates things even when I don’t realize it. To keep some of the essentials in easy reach, I just used this tiered fruit basket I found in the kitchen section of HomeGoods and spray painted it with Rustoleum Champagne Mist to match the light fixture. The two soap dispensers have lavender baby lotion and hand sanitizer in them alongside wash cloths and a few teether toys to keep Regan occupied during changes. 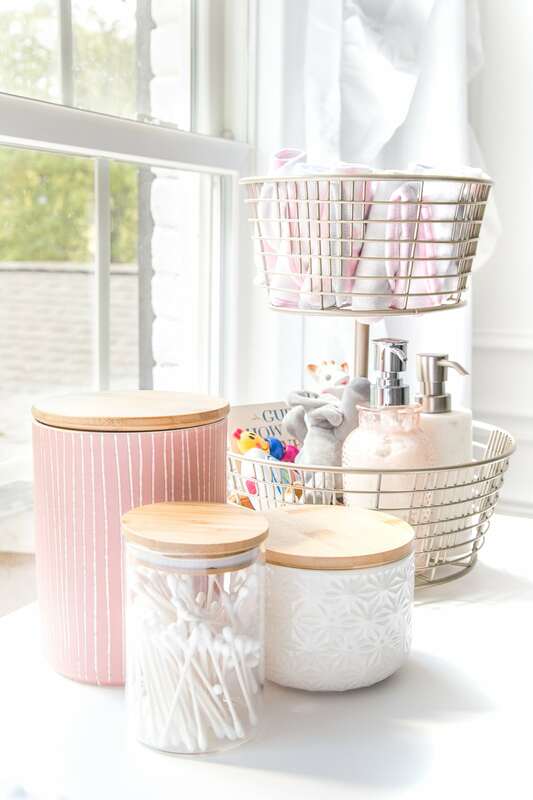 I got these three lidded glass and ceramic canisters in the HomeGoods kitchen section too for holding baby bows, pacifiers, and Q-tips. 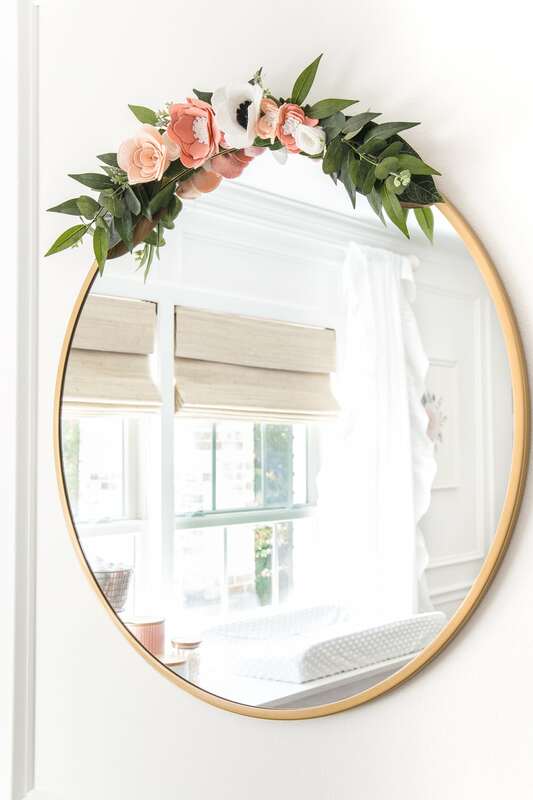 To help bounce around some extra light, I hung up this round Target mirror and added a smaller version of the felt flower swag for some balance. The little hints of gold add just enough warmth against all of the white. And for extra sleep help (because I’m taking all the help I can get), we hung up these blackout Roman shades in the color Bonaire Flaxen, but I’m totally willing to pay extra if it means this kiddo will sleep more soundly for daytime naps. I can’t believe it’s finished! 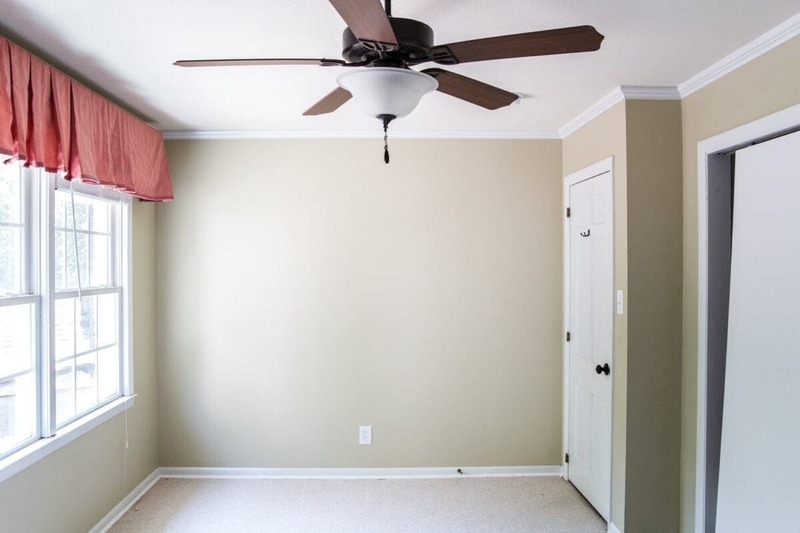 It’s taken me way longer than I thought it would to call this room complete, but I think part of me really wanted to drag it out and cherish every last bit of the sentimental. There’s a very good chance this is our last baby, so this nursery is rather bittersweet for me. Now that our sweet baby girl is here, I cannot wait to introduce her to y’all! For now though, we’re soaking up all of the snuggles we can get. what a dream nursery! Absolutely gorgeous! Can I ask where you got your doors? Did you put in the whole system or just attach door to old frame? It’s absolutely beautiful for your new little princess!! So beautiful! You are so inspirational! What a precious place to bring baby home to! 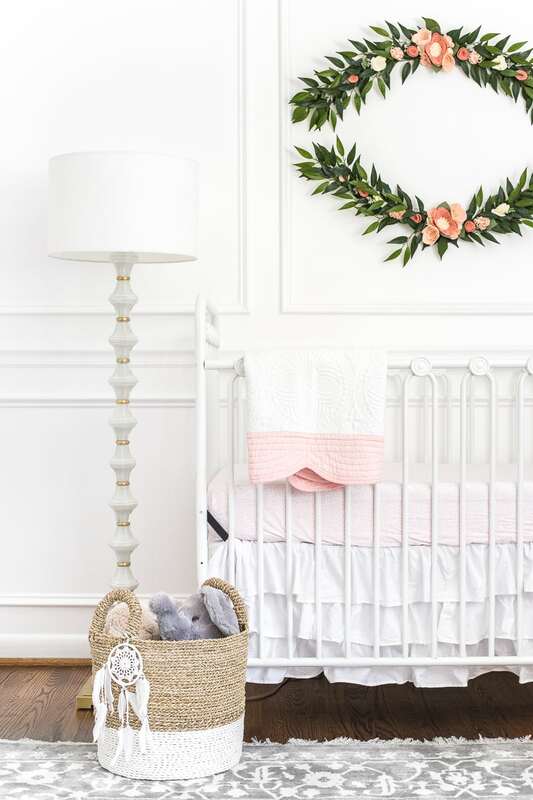 Love the soothing white and the soft pink touches…perfect for any little princess! Congratulations! Wow! I love this reveal! I don’t have any children yet, but this would be a definite look with the textures and the subtle hints of girly accents like florals and pinks! I agree!!! You are SOOOO talented! Your hard work shows off. Very well done. Thanks for sharing. While it IS pretty- where is the COLOR? Babies love bright color. I’ll never understand the white and gray nursery craze. 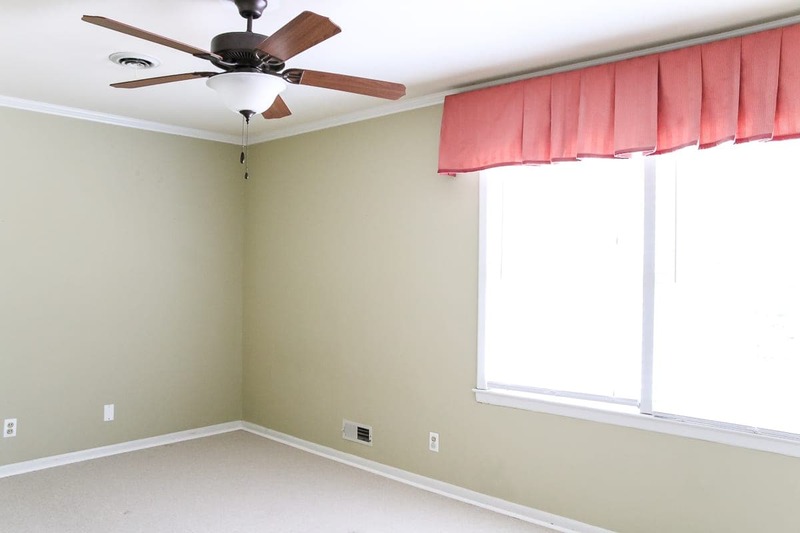 This room is more suited to an adult woman. Whatever happened to people using actual color to decorate? Everywhere you look in showrooms, magazines and on tv is white on white on white with a touch of gray. Halloween, Thanksgiving, Christmas- white pumpkins , gray pumpkins, white cornucopias, white, tablecloths, white runners, white trees, white ornaments, white lights, white candles white white white. Wow! This room has got to be the most beautiful Little Girl Nursery I have ever seen! You are amazing!! ***UPDATE***…. She’s here!!!?????? ?☺️☺️☺️ Happy 1-Week Birthday, Baby Regan!!!?? I want that to be my room. So serene. It is stunning, Lauren. I love all the special touches for your new little sweet pea. Can’t wait to see pics of her showing off her new room. Enjoy your precious blessing. God is good! You did an amazing job at creating a beautiful and serene nursery. Enjoy your new little bundle. Really beautiful. Did you finish the inside of the closet? I did! Sharing it Friday. 🙂 It was all going to be too much to squeeze into one post. Hands down, the most beautiful nursery I have ever seen. Congratulations on your new Blessing ! Do you mind me asking where you bought your new closet doors? 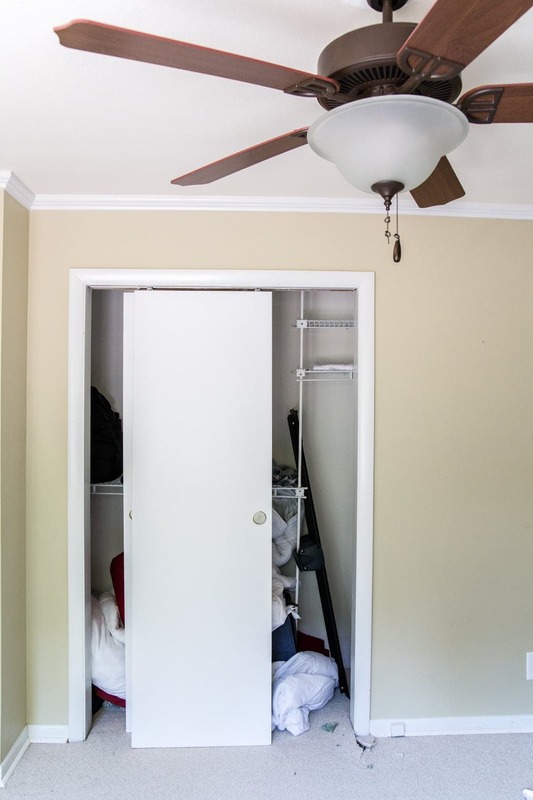 I have split closet doors as well and have been looking all over to replace them. Hi, Ann!! Not at all!! The new doors are basic hollow core bifold doors. We purchased them from Lowe’s. Your new baby truly is a princess, you have done an outstanding labor of love. Can’t wait to see the second-in-command. Just lovely. So soft and serene. The perfect setting for baby bonding! Best wishes! It is absolutely perfect. So beautiful and peaceful. Absolutely beautiful! I’m sure your sweet baby loves it. 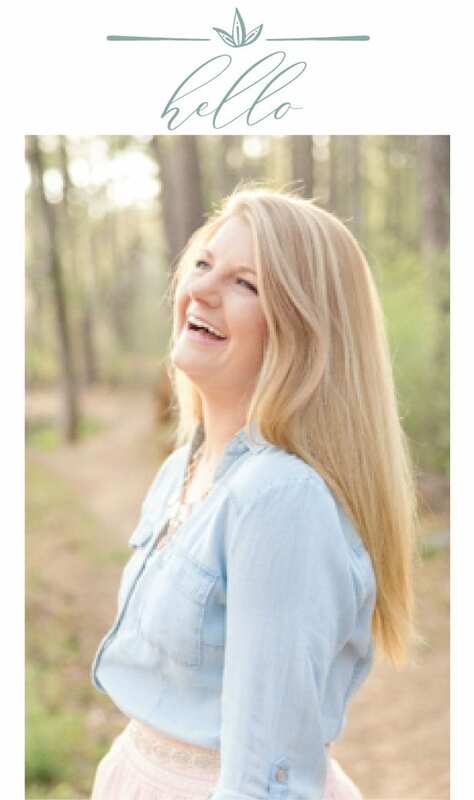 I can’t wait to see her picture. Congratulations! Lauren, congratulations, and that is a beautiful nursery! I think I saw some pillow covers at Hobby Lobby that have succulents and flowers on them. I remember them and they look a lot like the pictures you have on the wall. That would be in the section where they sell throw pillow covers. Which I like to use, by the way. congratulations on your new arrival! and congratulations on her gorgeous new nursery! 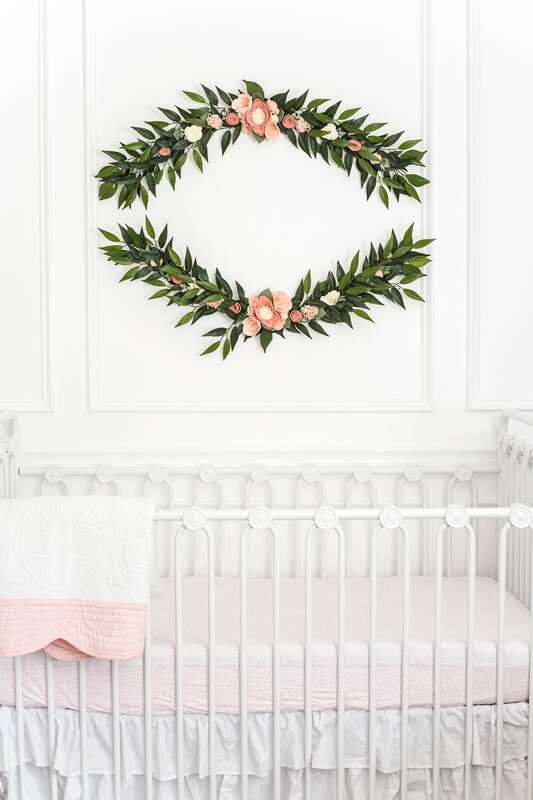 It is the most gorgeous nursery creation! But I am sure it pales completely with your beautiful baby and your big girl. Best wishes to you all! So happy that your precious little darling baby has arrived! What a gorgeous room she has! It’s just beautiful! May you all be blessed with your newest family member! Spoil her lots! WOW…. Precious …. 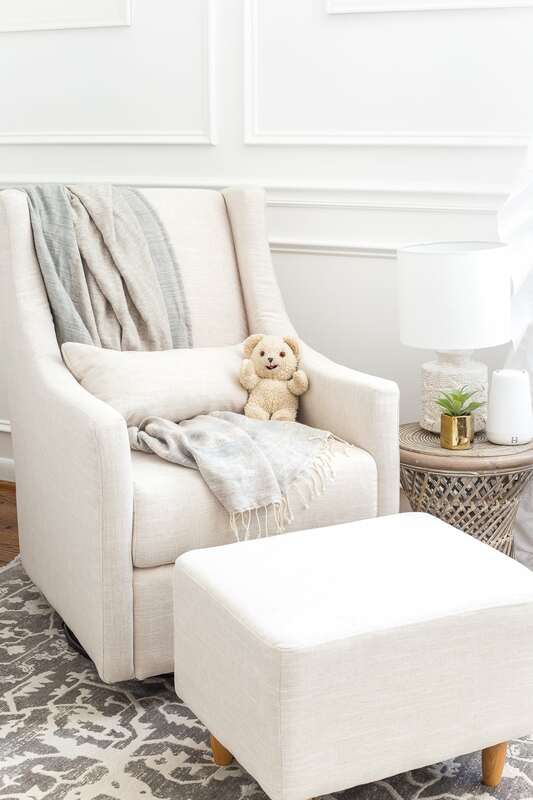 this little one is coming home to a gorgeous… & … serene nursery !!! Just beautiful !!!!! Congratulations on the new little one that is headed your way !! So precious!!! Congratulations to you and your family! I love all of your makeovers but I have to admit, this one is my favorite. It is stunning – so elegant and simple yet such a statement. Congratulations and enjoy the time with your sweet little one! Thank you, Laura! You are so kind! We are enjoying her so much! The words that come to mind in describing your nursery are dreamy, sparkling and lovely. Every detail well thought out. Looks like a tranquil setting for snuggling. Your family is in my prayers! Enjoy, enjoy, relax this is one of the most cherished, blessed events a family will enjoy. I can picture sweet Olivia being Mommy”s little helper. I have an Olivia too she however is full grown now. My how time does fly. The Lord’s blessings to you all! Cindy, thank you for your sweet message. Olivia is a huge help. We hold a special place in our hearts for those who share the name of those we love. Blessings to you and your adult baby, too! Lovely room! 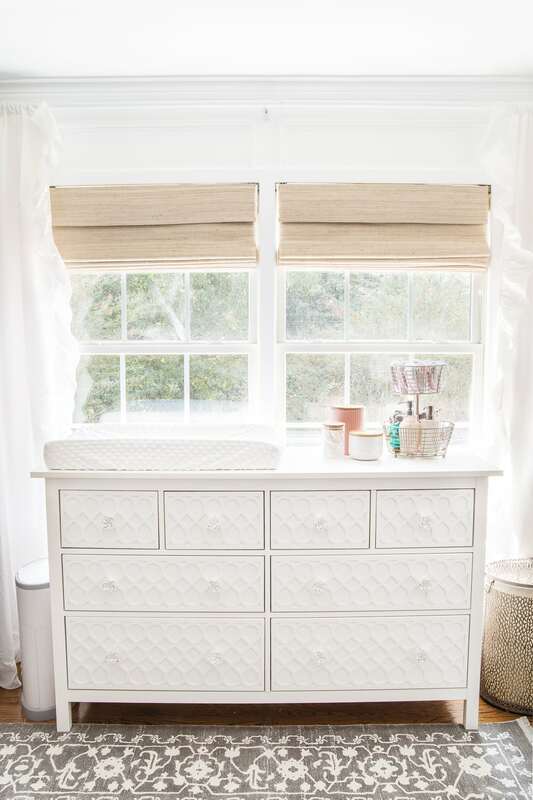 Do you have any recommendations for an affordable roman shades option similar to the one you have in your nursery and other rooms? Thanks! The link to the blinds we have in the nursery is https://www.blinds.com/p/blindscom-woven-wood-shade/501858?color= . However, when wanting black out shades and curtains they will tend to be on the higher price spectrum. Through this link you should be able to search your personal price range. 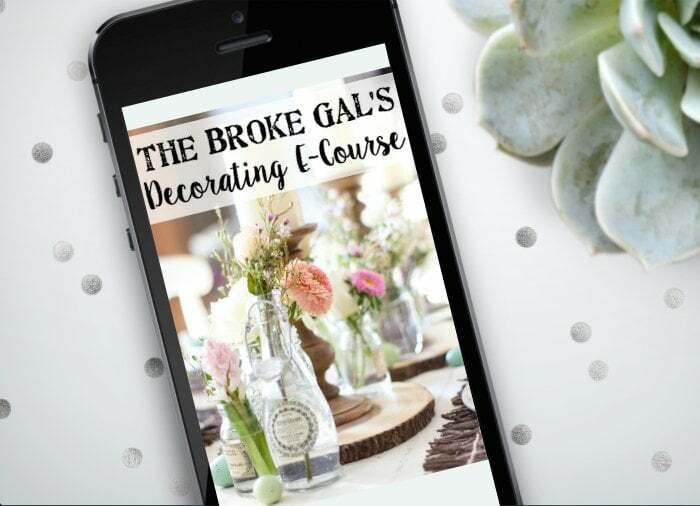 I hope this helps direct you to what best fits your budget. Thank you! 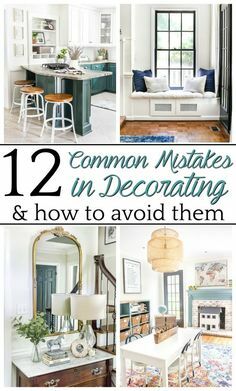 I truly appreciate your help and home decor inspiration! Hello Lauren. I am fairly new to your site. i found about it from the BHG article. What a blessing you have been. Could you please tell me where did you purchase the new closet doors for the nursery? And are they easy to install? Thank you! This is for sure the most beautiful nursery I have ever seen! Hi Lauren! I’m considering that rug for a playroom – I love it! 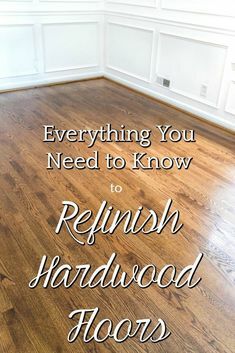 Would you recommend it, or is it too light for a high traffic area? The kids wear shoes and eat snacks in there. Thanks! P.S. 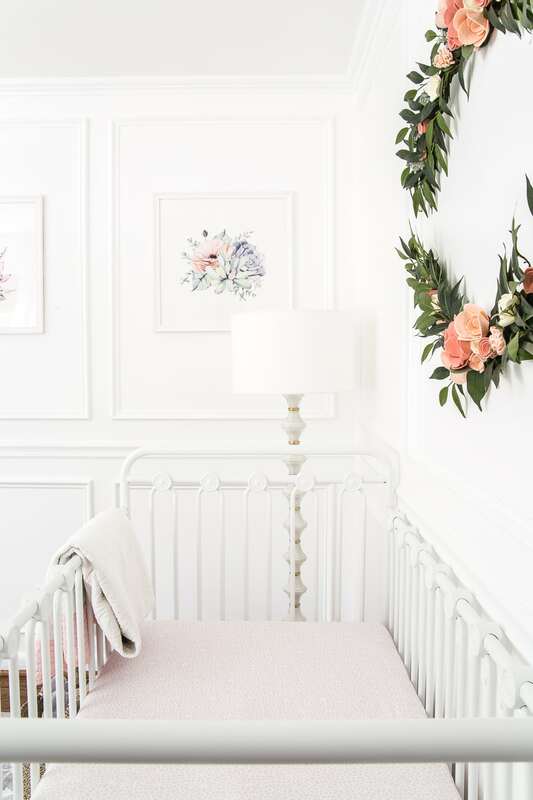 Love the nursery – congrats on your new baby!